The S&P 500 fell 0.14% which puts it in a 4 day losing streak. There’s not much to make of this losing streak. The S&P 500 is near its record high. In fact, its outperformance of small caps is more notable than this mini losing streak. The Russell 2000 was down 0.47% on Tuesday. It’s down 6.8% from its record high on August 31st. 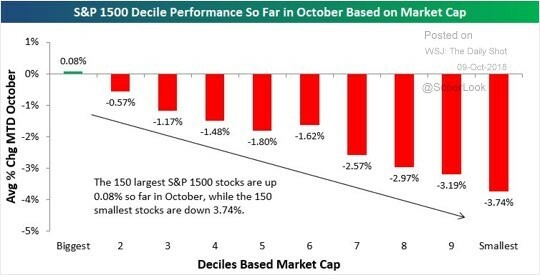 The chart below shows the S&P 1500’s performance in October by decile. As you can see, the largest decile is up 8 basis points. The smallest decile is down 3.74%. S&P 1500 is down 1.38% this month, but the average stock is down 2.75%. There are 106 stocks down 10% or more, but only 15 stocks up 10% or more. Median stock in the S&P 500 is 10% off its 52 week high. However, the median stock in the S&P 600 is 17% off its 52 week high. Anyway you slice the data, small caps have been doing poorly lately. Rising interest rates don’t help the heavily indebted small firms. The best sectors on Tuesday were energy and utilities as they went up 0.99% and 0.42%. The most curious part of this move in rates is the action in utilities. S&P utilities sector increased 5.3% from September 26th. That’s directly the opposite of what you’d expect based on the recent move in yields (besides Tuesday). I’m usually on the side of the bond market, but this time I believe stocks. The two worst sectors were the materials and industrials which fell 3.4% and 1.51%. The worst performer in the materials sector and the S&P 500 was PPG as it fell 10.06%. Its stock bounced back after hours. This was because activist investor, Nelson Peltz, reported a stake in the company. It increased 4.91% as of 6:15 PM. This stock is supposed to be an indicator of global economic growth. The stock fell during normal trading hours because of bad guidance on Monday evening. PPG expects Q3 EPS to be between $1.41 and $1.45 on revenues of $3.8 billion. This was below estimates for $1.59 in EPS and $3.9 billion in revenues. This adds to the number of firms with negative guidance. It was already running above average. The catalyst for the weak guidance was increasing raw materials and logistics costs. Two notable price increases were in epoxy resin and oil prices. The firm said this is the "the highest level of cost inflation since the cycle began two years ago." Another reason for the negative guidance was weakening demand from China. There was also weakness in automotive refinish sales from several customers in America and Europe. Finally, it expects Q4 EPS to be between $1.03 and $1.13, but that all depends on commodity prices. The rise in interest rates has catalyzed weakness in the big internet growth names such as Netflix which is down 15.1% since July 9th. The Chinese market has been weak because its economy is cratering. There was a sharp reversal in the Shanghai Composite’s downtrend from September 17th to the 28th as it increased 6.39%. However, it fell 3.72% on Monday. This should keep it in bear market territory for at least a few more weeks. 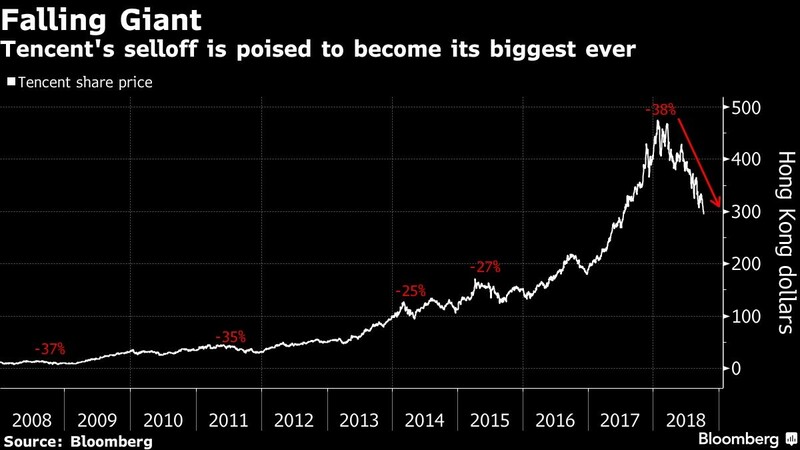 The combination of weakness in the top internet firms and the weakness in China puts Tencent in a precarious situation. As you can see from the chart below, its 38% decline is its biggest since at least 2008. It has lost $220 billion in market cap. As of my latest check, the stock is down 39.11% since January 23rd. Snap stock crashed again on Tuesday as it fell 6.42%. It is down 53.18% year to date. The stock fell Tuesday because of a dire note from an analyst from MoffettNathason. The analyst predicted the company would need to raise money by the middle of 2019. He also lowered his estimate for revenues in 2019 by 7% and 2020 by 15%. Twitter was able to achieve profitability. But this analyst doesn’t think Snap’s management team will be able to execute the same way. I think the company has taken the first step towards a turnaround by admitting it made a mistake with its redesign. The problem is it didn’t listen to the user outrage initially. The firm was basically forced to listen to users. Its stock has been destroyed. Investors are betting against Snap’s ability to regain momentum and achieve profitability by 2019. CEO Evan Spiegel mentioned this as a goal in a recent memo to employees. It’s interesting to see Facebook’s stock crater even as one of its main competitors is reeling. Investors in Facebook are more worried about rising rates, regulations, and hacks than competition from Snap. Finally, after a massive selloff in the long bond, it rallied on Tuesday. The 10 year yield fell 3 basis points to 3.21% and the 30 year yield decreased 4 basis points to 3.37%. Since the 2 year yield was flat at 2.89%, the curve flattened. The difference between the 10 year yield and the 2 year yield is 33 basis points. I still think this steepening in the past few weeks was a trend correction. My original prediction of an inversion by June 2019 still stands. Anyone expecting an inversion to predict a 2019 recession was wrong. But there’s still a chance a curve inversion predicts a 2020 recession. Either the 10 year yield will fall because growth is decelerating which will invert the curve or inflation will come. Inflation is the main catalyst of recessions. The correction in small caps could be in part due to the rise in rates. However, small caps fell even when the long bond rallied on Tuesday. I don’t think this is the beginning of a bear market in small caps. It’s a volatile segment of the market. I do think the long bond is due for a rally that lasts more than one day. Keep in mind that it’s very difficult to predict the week to week action in markets.